WhatsApp, the world’s best instant messaging app, never ceases to amaze its users. There’s a reason why people always head over to this app despite trying various other instant messaging apps. With a consumer base of around 1 billion, this app always makes its users come back to its platform. Owned by Facebook, WhatsApp is equipped with many mindboggling features which makes your conversation smooth and convenient. It lets you share all sorts of media – text messages, statuses, photos, videos, audio files, GIFs, documents, and contacts with your phone contacts. Apart from this, the instant messaging app has recently launched a new feature – live location sharing which adds more glimmer to the already built positive reputation in the market. Live location feature allows you to share your location with your WhatsApp contacts in real time. Hearing this, some users might get confused because there’s already an option of sharing your location with your phone contacts on WhatsApp. It is important to understand the key difference between that and the new live location feature. The previous feature was static and can be shared for one time only. However, the new live location feature is quite dynamic as it keeps updating your location in real time, even when you’ve closed the app and is only running in the background discreetly. Since the location is shared at the chat level, you can get to track your friend’s location in a one-on-one conversation or a group chat taking place on WhatsApp. This feature is quite helpful especially for women and kids when they want to share their location and whereabouts with their family members and friends while traveling. It keeps other party informed about their location in real time. In fact, if someone faces a disaster or is going through a critical situation during traveling, he/she can inform the family members or any friend by sharing their live location on WhatsApp. With the help of this, the concerned party can take an immediate action to provide help and relief to the person in a problem. Step 1: Head over to WhatsApp and open a chat with the person or the group you want to share your live location with. Make sure you have updated your app before looking for the new feature. Step 2: Once the chat window is opened, tap the attach button present on the text message bar where you type the message. Step 3: Here you will select ‘Location.’ You will now come across a new option named as ‘Share Live Location’. Step 4: Select ‘Share Live Location’ and then set the time for how long you want to share your location with someone. The duration of the time is set for the share feature to stay active. You will be given three preset options to choose from – 15 minutes, 1 hour (which is set as default), and 8 hours. There’s also an option to add a comment. Step 5: After choosing the time duration, your live location will be shared in real time with the person or the group on WhatsApp. 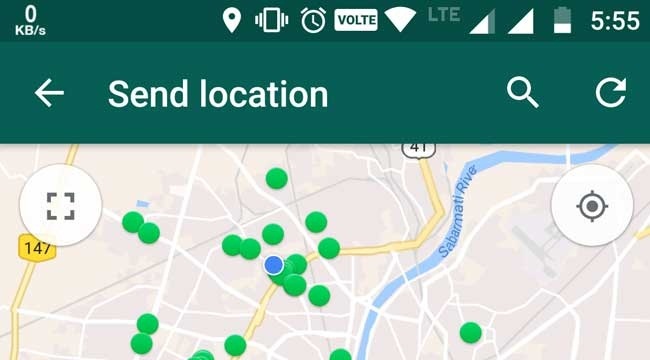 According to WhatsApp, if one more than one person will share their live locations in the group, then all their locations will be visible on the same map. WhatsApp isn’t the first social media platform to bring live location sharing facility for the users. Similar to Telegram, WhatsApp also gives its users the choice to select from three different time durations. Contrastingly, Facebook’s own instant messaging service – Facebook Messenger allows users to share locations with their friends in real time but only for an hour time at a time. It doesn’t let you share the location for more than one hour at one time. Now coming to Apple’s iMessage, it lets users share their locations with others for an hour until the end of the day or even indefinitely, which works great especially when you’re getting to share your location with your family and close friends at any given time. As far as Google Maps is concerned, we all know it’s not an instant messaging service so making its comparison with WhatsApp would somewhat seem pointless. However, this app did introduce a live location feature earlier this year. In fact, it is regarded as one of the most used apps when you are looking up for a certain location or driving up to meet someone. Users of Google Maps can share their location with others for anywhere between one hour and permanently. One thing that needs to be kept in mind while sharing your location with someone via Google Maps is that this app uses links to share your location with someone, which can be then shared further with other people without you knowing. This can indeed raise privacy concerns for you. Therefore, you need to think twice before sending your location with someone you barely know. Live location sharing will be available for both Android and iOS users and will be rolled out globally in the coming weeks. For instance, if you are using WhatsApp Web service and then someone shares their live location with you, a new placeholder will be shown to you indicating that the live location can also be viewed on the phone. The product manager at WhatsApp believes that the feature is going to have a wider grip over its massive user base. For your information, WhatsApp has over 1 billion daily active users and over 1.3 billion monthly active users which is quite an achievement for this instant messaging service.